It's going to take me a while to get back into the swing of things with this blogging business, so please bear with me if these start off rather disjointed and difficult to read. It's only January, but with the Vikings out of the playoffs, Gopher basketball and hockey middling along and the Timberwolves... well, I won't even go there, Twins fever is slowly starting to catch hold. Wednesday night, I went with a few friends to watch the taping of ESPN's "Homecoming" with Rick Reilly, featuring the Hometown Hero himself, Joe Mauer. ESPN crammed almost 4,000 people into Cretin-Derham Hall's new gym (which is pretty nice, by the way) and the event was definitely a worthwhile one. Some of the recognizable faces in the crowd included Twins' GM Bill Smith, former GM Terry Ryan, longtime Mauer teammate (and on-field mentor) Mike Redmond, agent Ron Shapiro and nearly the entire Mauer family. - While most of Mauer's family was pretty "aww shucks" during their interviews (not unexpected) Grandpa Jake can, as advertised, can spin a "colorful" tale... He had a couple of gems that aren't likely to make it onto ESPN, I think. - I've always thought Rick Reilly was terrible on TV (in fact, I've always believed he was terrible at everything other than writing for the back page of Sports Illustrated), and these notions were confirmed Thursday. He's like a cross between Jim Souhan and Jimmy Fallon -- he never stops laughing at his own un-funny sports cliches/jokes. - Ron Shapiro is a decent guy as far as sports agents are concerned, but he's still a showman -- he did his best to play up the Mauer Legend, even on the eve of a (probably) $160-$200 million payday for his client. - The rousing boos that ensued when Reilly suggested Joe would be happy to catch Mariano Rivera on a regular basis were entertaining. - Reilly would NOT stop trying to get Joe to do something outlandish -- whether it be dance the moonwalk (something his friends said he was good at) or break out his rap lyrics. Joe wasn't about to break character in front of 4,000 people and a national audience, and I give him a lot of credit for that! - When asked if he'd rather play for a winner or play at home, Joe's response of "Why not both?" drew the biggest cheers of the night. Good answer... Several eyewitnesses say that Smith and Shapiro shared a little fist bump after the comment... Take away from that what you will. - My favorite line of the night though? Reilly asks "Is there anything you're not good at?" The question elicits shrugs from the Mauer family, and Joe (truthfully) answers "I don't know... Probably this interview?" I thought that was highly appropriate! Overall, even though Joe won't be winning any personality batting titles anytime soon and Reilly is about as smug and annoying as can be, it was a cool behind-the-scenes event. And in the end, Joe's personality (or lack thereof) is one of the things that makes us like him -- he truly is One of Us. I enjoyed the Homecoming event in St. Pau as well. It was very intimate and for someone who went into it with no expectations whatsoever I'm happy to say I came out of it with more than I expected. I have to admit, I was hoping for something outlandish from Joe. No man can be that calm and polite all the time. Along with the amusement from Joe, I also enjoyed the experience of being part a live taping for ESPN. My low points for the night include the bleacher seating (yeah, ouch), the bus ride from the Fairgrounds to the school and oh yes, Shadow. He tortured me and offered me a t-shirt to make it better. Not cool. When does this episode air?????? I don't know! Good question. 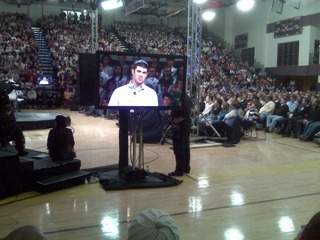 ESPN's taping of Joe Mauer Homecoming will air on ABC at 3:00pm CT on Saturday, April 10 and also on ESPN on April 12th immediately following the Twins vs Red Sox game. CDH's "new gym"? It's newer than the 'old' gym, but I believe it was built in 2002. But it is nice. The worst part is the sound system, which maybe they've fixed by now. I don't know, it's been a while since I saw a game there. I went to see this at cretin they said it airs in April, but never gave a specific date.